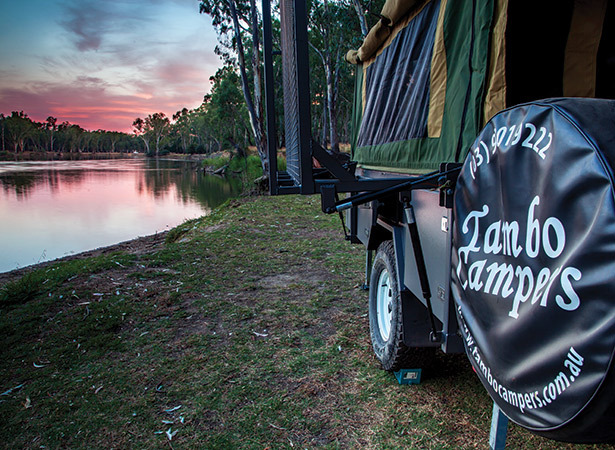 Tambo Campers is a well-established, Melbourne-based camper trailer manufacturer who had been making campers for about a decade before closing its doors in 2012. 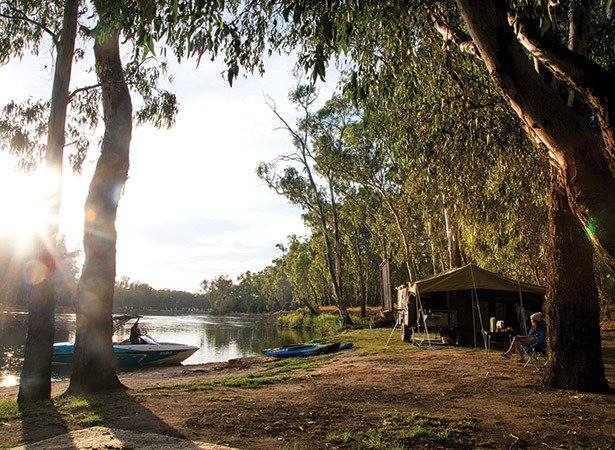 A year later, in 2013, Ian Peel decided to make his passion for camper trailers his profession, and purchased the business, operating out of a warehouse in Vermont, Melbourne. 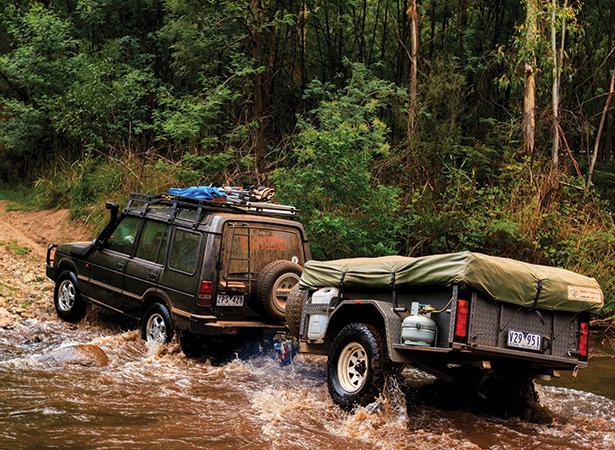 The trailers are still built Aussie-tough, made by the same Melbourne-based trailer builder and canvas sewer, both of whom are the original contractors employed by the previous management. 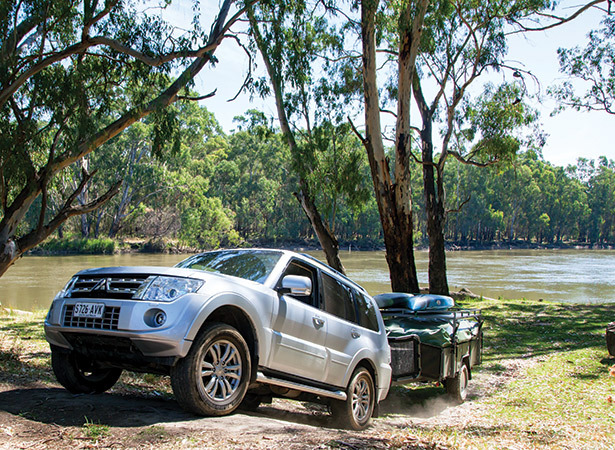 Tambo’s premium Omeo, an offroad softfloor competitively priced at $24,990 as standard. The 50x50mm Duragal chassis rides on nine-leaf Al-Ko rebound spring suspension walked over our bumpy riverside testing ground with ease. The drawbar is comprised of 100x50x3mm RHS Duragal steel and houses a Treg offroad coupling, an offroad swing-up jockey wheel, a handbrake and a lockable toolbox with dust seal, blanketed by a mesh stone guard with wings down the sides. While the toolbox has a gas strut, it was a little stiff to close and I found the edges to be a bit sharp. There’s space for three jerries behind the toolbox, although not in individual receivers. There are three 16in Sunraysia-style wheels and tyres (a spare rides on the tailgate), and they are pulled up by offroad electric brakes. 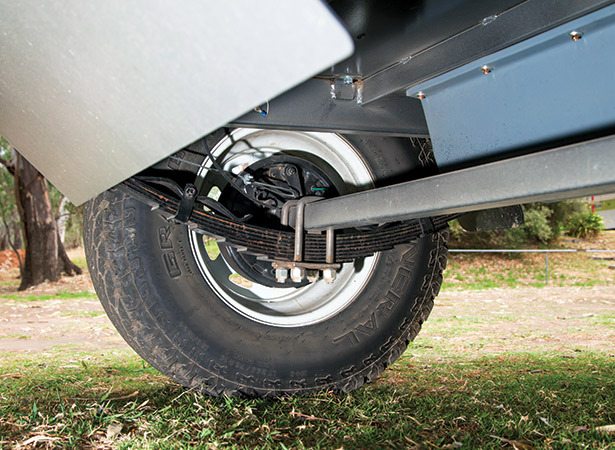 The trailer is supported by four robust swing-down stabiliser legs, and while you’re down there you’ll notice the 85L water tank on the underside is enclosed in a steel housing for protection offroad. The filler point for this is located in the rear left storage compartment, lockable along with the other three side storage compartments, and here you’ll also find a 4.5kg gas bottle. Both are connected to the kitchen via quick connect hoses from the rear of the trailer, but the fittings are different so you can’t mix them up after one too many glasses of boxed wine. The unit on test came equipped with an optional boat rack, which would set you back an additional $2265. It’s a sturdy unit that swings over easily on gas struts, locking into place either right over on the ground or in a vertical position as per the set-up photographs in this review. Its downfall, however, is that the two receivers need to be manually unbolted and removed in order to fold the tent over, and replaced again when packing up. This isn’t difficult to achieve, but it is one more thing to do at the end of a long day’s driving. The powder-coated steel kitchen slides on smooth runners out the rear of the trailer, and a bench extension is manually erected from three sheets of steel that live in canvas sleeves in the large kitchen pantry drawer, also on smooth runners alongside the kitchen drawer. Two sheets slot into receivers to form the sides of the extension, while a third, larger piece locks into place on top. While this process itself is only mildly annoying, the sharp edges on the steel were concerning and the hole cut to accommodate the hand-pumped tap was too large by approximately 5mm. A plastic bowl sink is then placed in the sink recess. There’s a two-burner portable Lido gas stove with griller. A simple arrangement, but it does the job. It’s not going to win any awards for innovation, but this kitchen is functional and has lots of storage space, with under bench and stove cabinets accommodating pots, pans and crockery. There is no fridge as standard, but there’s a 12V outlet to the right of the tailgate so you can plug in your own and have it at hand. The test unit was powered by an optional 120Ah AGM battery with CTEK 15amp 240V charger. The kitchen is lit by a single LED lamp, so we enhanced the lighting situation with our own LED strip light from Aussie Disposals, plugged into the aforementioned 12V outlet. The tent provides ample living space at 2700x3200mm, and the heavy-duty PVC bucket floor is very comfortable underfoot and looks as though it would withstand a mild flash flood. Indeed the entire tent is comprised of heavy 12.1oz Australian core-spun canvas throughout. 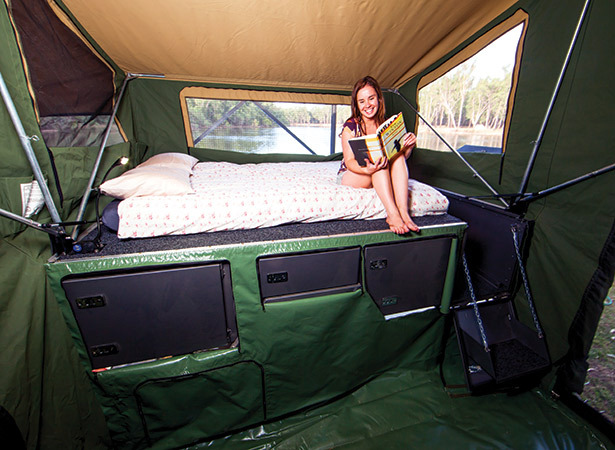 The three windows surrounding the bed are internally opening, while the remaining windows to the tent will require a midnight dash outdoors should the rain start coming down. The tent has two doors, one at the back where there is provision for an optional side bedroom, and one at the front leading to the 2100mm wide awning. The awning is erected simply using only six support poles. The absence of spreader bars certainly takes the headache out of setting it up, but would likely also result in pooling water on the roof in a downpour. The bed platform is marine carpeted and houses a queen innerspring with about 10in spare width for phones, glasses, books and water bottles. It is accessed by a walk-up passageway, also marine carpeted, the stairwell to which is sturdy underfoot however requires the manual removal of a crossbar upon set up. At the end of this passageway is a carpeted luggage shelf big enough for a decent-sized duffle bag. The trailer’s tent-side storage compartments, including one cavernous compartment running the width of the trailer, are accessed via zips in the canvas. The under-bed storage is accessed via a gas-strut assisted bed-lift. 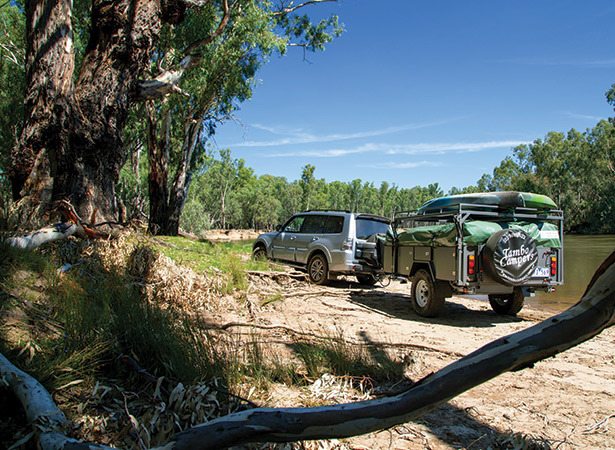 As an all-Aussie offroad camper trailer with most of the basics covered, the Omeo is pretty good value at the $25k mark. 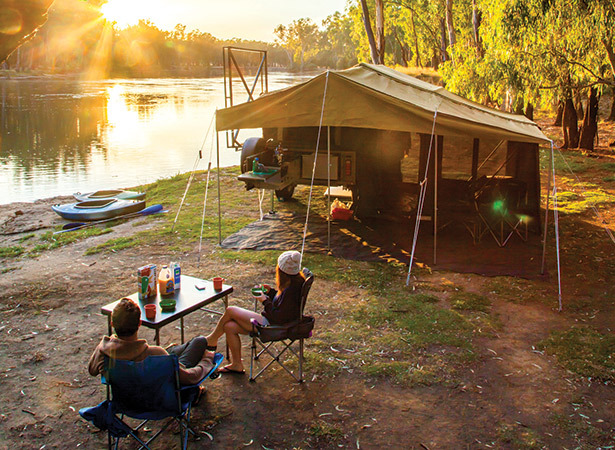 In an economic climate that has been hard on leisure industries such as RV, it’s great to see a much-loved Australian camper trailer brand rise from its sleep and tackle the market once again. And with a few refinements, the affordable Omeo will be a fierce competitor in the dense softfloor sector. Search for used Tambo Omeo camper trailers for sale. 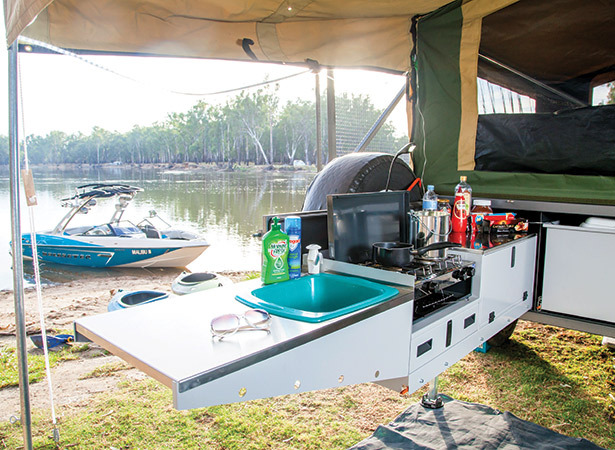 Search for new Tambo Omeo camper trailer for sale.